Volvo VCS 1027, 1375 test is a procedure developed to evaluate the corrosion resistance of metals in salt rich environments, predominantly from a marine influence or from the effects of winter de-icing. The test is intended to be applied to surface coatings in addition to automotive components to ensure the accelerated corrosion corresponds to experienced natural conditions on different materials and coatings. For test subjects that would naturally be exposed to extreme environmental conditions, such as components within the engine bay, there are variations within the standard to include additional exposure to wet conditions and low / high temperatures, the standard also contains variation for components likely to be exposed to heavy soiling but limited leaching, where dirt containing salt is utilised as opposed to salt spray. When the salt spray variant of this test is implemented a 1 % by weight sodium chloride solution with a small addition of sulphuric acid (0.05 mM) to yield a pH of approximately 4.1 is sprayed on the test subjects from a device consisting of a number of nozzles mounted in series on a rail or a tube, to achieve a spray pattern in the form of a fan, partly overlapping. The rate of falling fluid shall be minimum10 mm/h everywhere on the test plane. Other Volvo corrosion standards recommend the use of oscillating spray nozzles located high up in the test chamber. These spray salt water solution down on to test samples located beneath, in a precise spray pattern, to ensure a uniform distribution of salt mist falling on the test objects. In addition to the application of salt the test samples are exposed to drying and controlled temperature and humidity phases, the total length of the test process should be determined as part of the test procedure. Forced drying is recommended as part of the test process where an automatic spray rig is utilised, this is preferably achieved by creating a forced flow of pre-heated ambient air to ventilate the chamber. For a climate chamber of the volume 1 to 2 m3 an airflow rate of 50 - 100 l/s is recommended. Where optional low / high temperature testing is selected it is important to ensure that the equipment utilised for exposure to low/high temperatures really is able to meet the temperature requirements specified. Large mass loads may require substantial cooling capacity in order to reach the required low temperatures. Compulsory Climate Cycle (Variants 1, 2 or 3). Compulsory Salt Exposure (types A, B or C). Optional exposure to High / Low temperatures. Three repeating alternatives are available, each with a total cycle duration of 12 hours. Stage 1. 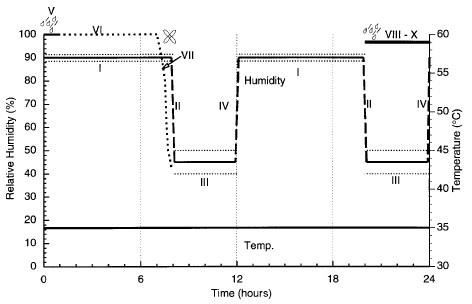 Constant temperature of 35 °C and relative humidity of 90% RH for a period of 8 hours (transition from Step 2 must not be longer than 30 minutes). Stage 2. Constant temperature of 35 °C and relative humidity of 45% RH for a period of 4 hours (transition from Step 1 must not be longer than 30 minutes). Stage 1. Constant temperature of 35 °C and relative humidity of 90% RH for a period of 7 hours. Stage 2. Continuous and linear change to 35 °C and relative humidity of 45% RH over 90 minutes. Stage 3. Constant temperature of 35 °C and relative humidity of 45% RH over 2 hours. Stage 4. Continuous and linear change to 35 °C and relative humidity of 90% RH over 90 minutes. Stage 1. Exposure at a constant temperature of 35 °C and a constant temperature in the humidifier of 33 °C (resulting in 90 % RH in the test cabinet) for 7 hours. Stage 2. 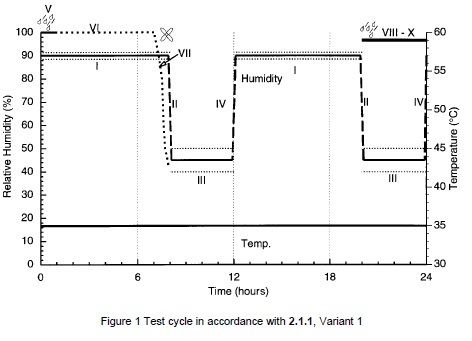 Continuous and linear change in temperature to 42 °C over 1 hour at a constant temperature in the humidifier of 33 °C (resulting in a change from 90 % to 60 % RH in the test cabinet). Stage 3. 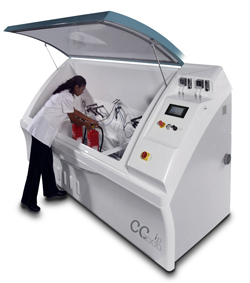 Exposure to a constant chamber temperature of 42 °C, and a constant temperature in the humidifier of 33 °C (resulting in 60 % RH in the test cabinet) for 3 hours. Stage 4. 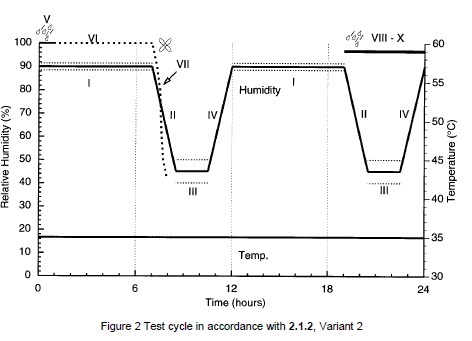 Continuous and linear change in temperature to 35 °C over 1 hour at a constant temperature in the humidifier of 33 °C (resulting in a change from 60 % to 90 % RH in the test cabinet). The three alternatives outlined below follow the cyclic phase, all three salt exposure options can be interchanged with the three cyclic alternatives. Whilst utilising an automatic salt spraying mechanism for spraying the test samples, the following are undertaken on a Monday and Friday only and replace Stage 1 from the chosen Climate Cycle, for the rest of Monday / Friday the chosen Climate Cycle Variant is repeated. Constant spraying of the test samples with salt solution for a period of 1 hour. Exposure of the test samples to constant wetness for a period of 7 hours. When this automatic mechanism is utilised the wetness inside the chamber must be dried out before regaining climatic control, this is preferably achieved by allowing a forced flow of ambient air ventilate the chamber, in practice it is recommended to pre-heat the incoming air to a temperature 5 °C higher than the required chamber temperature. These two alternatives involve the manual immersion or manual application of artificial dirt to the samples, for further details of these methods please consult the standard. Immersion in or automatic spraying of salt mist for 30 minutes followed by a few minutes natural draining (Note: this stage is not undertaken when dirt is applied, instead the test subjects are transferred directly to a freezer for 30 minutes). 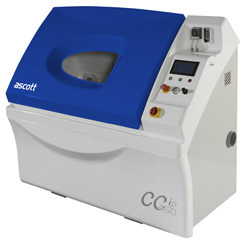 Exposure to a temperature of a minimum of -30 °C for 90 minutes, ensuring an object temperature of - 25 °C or lower. 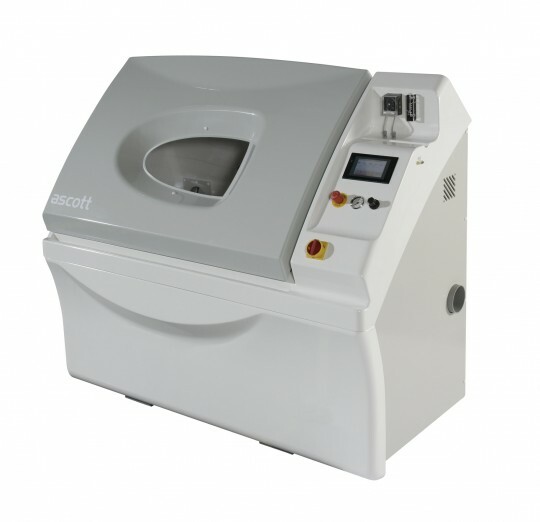 Exposure to a temperature of + 96°C for 1 hour, ensuring an object temperature of at least + 90 °C. Storage at room temperature up until the time of the regular salt exposure, this is now performed for 30 minutes instead of 1 hour due to the immersion performed before the high / low temperature phase, however, if an automatic spray rig is utilised it is permitted to spray for 1 hour in accordance with the standard programme (Note: this is not undertaken on samples with dirt applied, these are left to cool for another 30 minutes in ambient conditions). Developed by Volvo, VCS 1027, 1375 is a widely utilised corrosion test standard within the supply chain for automotive components to the Volvo Group.